Conduct Disorder (CD) is a childhood or adolescence psychiatric disorder that presents as a repetitive and persistent pattern of behaviour which involves the violation of others’ basic rights or anti-social behaviours (American Psychiatric Association, DSM-5). The primary diagnostic features of CD include aggression, theft, vandalism, violation of rules, and lying. While most youth exhibit instances of poor judgement and bad behaviour, youth with CD display these problematic behaviours repeated for a period of at least one year. Additionally, the behaviours result in the youth experiencing significant impairment in social, academic, or occupational functioning. The DSM-5 identifies fifteen criteria, of which a youth must exhibit at least three over the course of the past twelve months and at least one of the criteria must be present in the past six months. 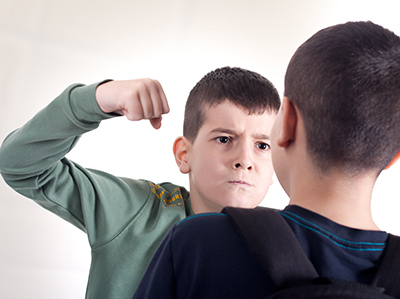 Youth with CD will often bully, threaten, or intimidate others. They may harm people or animals, or destroy property with the intent of harming others. They often violate rules regardless of the severity of punishments. They will have disregard for the welfare of others and little remorse about harming others. They may exhibit remorse but this is instrumental towards their avoidance of punishment. They perceive threats from others when no threats exist and this perception may result in them lashing out aggressively without being provoked. The world-wide prevalence of CD is estimated at approximately 5% of all youth. In North America, studies have estimated the prevalence of CD in youth to range from 1% to 16%. A 2014 study from the British Columbia Ministry of Children and Family Development estimated the prevalence of CD in Canadian youth to be approximately 2.1%. In most studies, boys with CD tend to present two times more often than girls with CD. Some research suggests that CD precedes mood and substance use disorders and most often occurs after impulse control and anxiety disorders. It is estimated that 40% of youth diagnosed with CD will eventually be diagnosed with antisocial personality disorder (ASPD) as adults. It is believed that CD arises through an interaction between genetic and environmental factors. Youth with CD may be born with a genetic predisposition for a greater need for stimulation (e.g., they will tend to engage in a higher level of sensation-seeking behaviours). This need for stimulation is linked to deficits in the neurotransmitter systems of the brain (e.g., noradrenergic, serotonergic, and dopaminergic systems) which are involved with behavioural control. Additionally, impairments to the frontal lobe (e.g., through genetics, inheritance, or injury) can result in problem-solving, memory, and emotional expression deficits which can contribute to a lack of impulse control, reduced ability to plan future actions, and decreased ability to learn from past negative experiences. Environmental factors that are associated with conduct disorder include developmental risks, family dysfunction, abuse, trauma, poverty, and low peer acceptance. Prenatal and postnatal brain development is affected by environmental factors such as poor nutrition, maternal stressors, maternal substance use, and atypical child-parent interactions. Authoritarian parenting, which involves extremely restrictive and demanding parenting, has been shown to increase the likelihood of a CD presentation in youth. Authoritarian parenting involves restrictions of a youth’s autonomy, stringent rules, and harsh punishments. In these environments, youth come to believe that they are not responsible for their actions. Exposure to violence (e.g., victimization, witness child abuse, community abuse, and parental abuse) in the home and community increases the risk for CD. Violence experienced or observed by a youth offers a model of behaviour which the youth may adopt as his or her own way of being. As a toddler (ages 1 to 3) signs such as an irritable temperament, poor compliance, inattentiveness, and impulsivity can lead to conduct problems. Often these problems are labeled with initial diagnoses of attention-deficit hyperactivity disorder (ADHD; problems with attention, excessive activity, or difficulty controlling behaviour) or oppositional defiant disorder (ODD; angry or irritable mood, argumentative and defiant behaviour, vindictiveness). In elementary school, children with CD tend to be more aggressive, exhibit difficulties with social cues, and perceive other children as hostile. These children have limited social problem solving skills and tend to experience more conflict with their peers. By adolescence, children with CD often experience intense anger and resort to aggressive actions when in conflict with others. Adolescent children with CD will often fail to comply with rules or expectations, experience emotional overreaction, and fail to take responsibility for their actions. They will experience interpersonal problems and often feel alienated and rejected by family and peers. There academic performance will be significantly impaired and they will often experience further conflicts (e.g., with teachers) as a result. Children with CD tend to associate with deviant peers, providing a negative peer support environment that promotes further deviance. Many of these adolescents end up facing the youth justice system. Adults who experienced CD as youth often have lower rates of employment, fewer friends, difficulties in intimate relationships, and significantly higher rates of arrests. CD is difficult to treat and individuals with CD often experience a high rate of treatment failures. The difficulties with treatment typically stem from the individual’s problematic behaviours and the lack of adequate family and social support. Treatment programs for CD require carefully designed and coordinated interventions aimed at multiple areas of functioning. CD is typically treated with cognitive behavioural therapy (CBT) combined with parent training and family therapy. CBT includes interventions that address dysfunctional emotions and maladaptive behaviours and thoughts that the individual with CD experiences. CBT interventions promote emotional regulation, problem solving, anger management, moral reasoning, and impulse control. Parent training (e.g., Connect Parent Group, Incredible Years, Parenting Wisely, Defiant Children) aims to foster health parent-child attachments and help parents develop skills in empathy, effective affect regulation, and behaviour management. In some cases, an individual with CD may be prescribed medications. Newer antipsychotics, such as risperidone and quetiapine, reduce challenging behaviours. However, antipsychotics should be limited to particularly severe situations where the individual has not responded to other treatments. Psychiatric medications can cause serious side effects or adverse events, particularly in children and adolescents. Dr. Stephen Rochefort is a registered psychologist in the province of Alberta. For more information on this or any other forensic or clinical psychology topic, contact Dr. Stephen by email (stephen@viepsychology.com) or by phone (403.986.1044).